After 58 years, sometimes Christmas gets to be just so much rigmarole to get through. You know the drill. Even though I love Christmas and try to keep the true meaning in mind throughout, sometimes it gets to be just one more gift to wrap. It is too many dishes to wash, pies to bake, errands to run. When you are a child, every Christmas something new happens. As you get older, you are allowed new privileges, or you get to participate in school dramas and music concerts or dance in the Nutcracker. It’s pretty decorations and visits to Santa and then finding out Santa’s your dad and still trying to play the game for your younger siblings or cousins. It is exciting trips to see Grandpa and new toys and staying up late and eating cookies all day long. But how to keep the magic of Christmas alive when you think you’ve heard and seen it all? 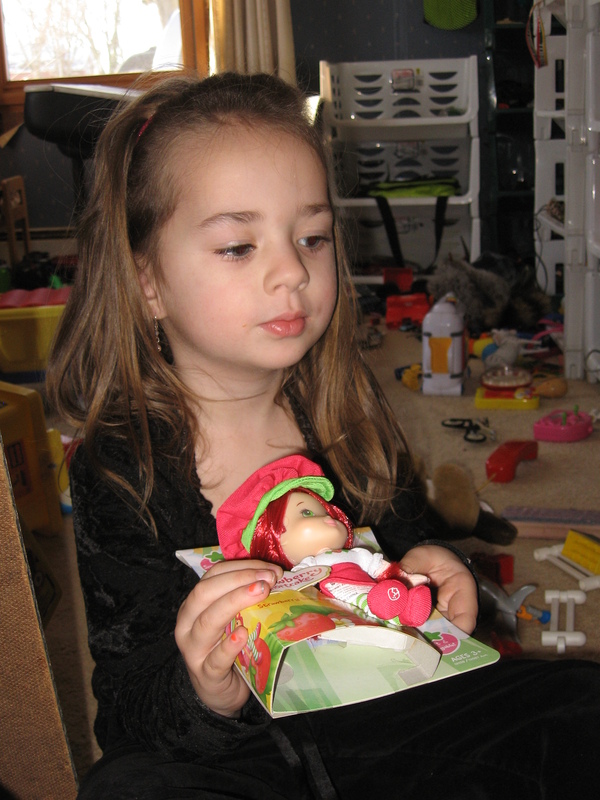 Great niece Jade, at Christmas, several years ago. A couple years ago my special Christmas moment didn’t come until New Year’s night, of all times. That was when my husband and I celebrated Christmas with my Indiana relatives: Mom, sister, husband, nephews, niece, great nephews and nieces and a few step-this or that thrown in. After our evening supper of “pick up” food and snacks, I was trying to keep a couple of kids occupied so they wouldn’t get bored in the rather subdued and QUIET atmosphere of the 55-and-up retirement complex where my mother lives. So I took the smaller kids out to the lobby fireplace where fake logs flickered invitingly and the Christmas décor was standard (but gorgeous) retirement home fare. The children were: a great niece just-turned-three; a great nephew, four; and a great step-niece, five. We took turns telling stories: they could be made up, true or a combination of both. The rule was you just had to tell whether your story was true or not. (The two younger ones had a hard time figuring out the difference between true and make-believe, not surprisingly, but that’s another blog post.) Sometimes we added to each other’s stories. I wracked my brain to come up with exciting memories from my own childhood to embellish my stories and they seemed to love them. I was on a roll. Then I said, “Shall we tell the Christmas story?” I wasn’t really testing them, or trying to figure out how much they knew, or how/if they were being taught Bible stories. I was just a desperate aunt trying to keep the entertainment ball rolling. Then her five-year-old cousin added, “To save us.” Again I could only affirm the direction the conversation was going, and let it flow. Kristin added, “And he died on the cross.” Right again. I think I added something appropriately affirming and theological, but the kids had preached their own sermon. They had boiled down the essence of Christmas and Easter and left my head spinning and my heart rejoicing. I knew that I finally had my special Christmas moment for the year, on New Year’s night, no less. I was pleased that these children were apparently getting the Bible stories. Their parents, like so many young adults in our culture, had come through years of not much church attendance. But now they were going to church and apparently the kids were being taught enough of the Bible stories to get Christmas oh so right. On that holy night in late December, the last night of the year, a pint-sized alleluia sang around my heart. They had ministered to me in my Christmas weary fatigue. Thank you Jade, Zachary and Kristin. What was your special moment this year? Or are you still waiting and watching for it? P.S. I’ve taken a bit of a blog break due to the holidays and wonderful visits with family, but plan to resume posting several times a week next week.